You must have heard this from your trainer a lot of times that the simplest way to increase your bench press is to Bench Press more each day. The more you do it, the more of its practice you achieve and the more improved your Bench Press formula turn out to be. With a correct and proper position, heavy weights and more often performed bench press; the progress will accelerate usefulness of the effort. It definitely intensify it and make an increase to your daily bench press but there is some information apart from increasing it day by day that can help you improve your bench press so much more. Mind plays a great role in any form of workout. If you put your mind into something you can do just anything in life! The main thing is to make up your mind for heavy lifting and when be focused on each rep while performing it. You must not talk or think about anything at that time. Your only focus must be on your bench press. It is very interesting that the right workout songs for a bench press help intensely for getting pumped up. You should include all those songs in your workout playlist which make you emotionally strong to lift. Also, visualizing your lift before you actually perform it is something really helpful. Though it seems a bit funny but research shows that visualizing an effective and successful lift before performing it can raise your strength. If you haven’t done weightlifting before or you have been weightlifting for less than a year, this tip isn’t for you mate. Nevertheless, if you have experience with weightlifting and you are a in a bench press work routine daily you can start working in diverse rep ranges. 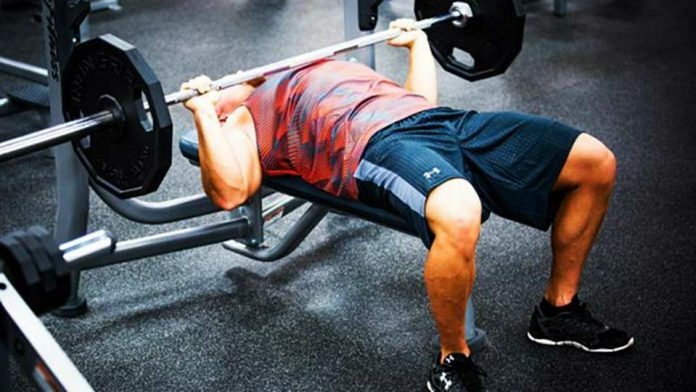 You must have known this that most guys perform bench press last in their workout. They typically initiate with dumbbells, then perhaps move towards Dips, and lastly perform some sets of bench press to end their workout. Well, researches such as this have exposed that the order in which you do your work out has a substantial and significant impact on your strength and overall performance capability on each one. That is the reason most latest work out regimes include complex lifts like the bench press, deadlift, and squat first and then towards the movements such as dips, dumbbells, lunges etc. So, the tip for you here is that you have to initiate your chest workouts with the Bench Press workout and you will achieve your body goals much faster. What is an ideal rep range? Well, finest training rate is a hotly debated topic. The conclusion to such debates is always that is it depends on the workout intensity and volume. If weights are light and sets are few in your workout, you can train the muscle group more often. And, as a outcome, if your weights are heavy and you have greater amount of sets per workout, then you can train the muscle group less. If you are doing less than this optimal rate, as mentioned above, you will be leaving some gains on the table. If you will do more than this, you might end up going into the overtraining zone. A part of the chest muscle known as the clavicular pectoralis forms the upper chest. An immaturely developed upper chest doesn’t only look weird but it also impact your complete Bench Press look. Escape this by continuously counting on inclined pressing in your chest workouts, which is more effective than the flat bench press. It has been a point that people tend to ignore. It is important if you want to increase your bench press and perform it with more strength, stay off the Smith machine. There is a simple reason behind it: Smith machine triggers less muscle fiber than the free weight Bench Press. If your gym has got only smith machines, you better change your gym. And if you can’t change your gym, then practice your bench press on smith machine as it’s still better than no bench pressing at all. Previous articleHow to conceal acne scars (or pimples!) in 3 simple steps? Beth Martel is a mother of two, a medical professional and a humanitarian. She blogs at HealthyRecharge.